Hats off to Brett Murray! - Brett Murray in the celebratory skate after scoring a hat trick against the NTDP U17s. Almost every year, I hear people talking about the NTDP U17 squad as not being as good as last season's. Okay, last season was an exception when you have kids like Jack Hughes and a couple others who are obviously heading towards a first round NHL draft position even at age 16. This year I can confidently say this years U17 isn't as good as last seasons, or the past several seasons. After the first meeting of the Phantoms and the U17s, I am left unimpressed with the NTDP's younger group. The Phantoms got things rolling early. On the rush, Matthew Barnaby was unable to take a pass that would have put him in on a breakaway but he was the first to the puck behind the USA net where he centered a no-look behind the back pass to a trailing Trevor Kuntar, who put the puck behind NTDP netminder Noah Grannan at 4:24. The Phantoms continued to dominate in the first half of the opening frame. The NTDP did not even register a shot on goal until the 8:13 mark of the frame. They tied the score at 1 all when Zakary Karpa hit a trailing defenseman, Eamon Powell, who put a shot high from the high slot stick side on Christian Stoever, who may have been partially screened by one of his own players, at 9:15. In the second frame, the U17s started to build a slight edge and eventually took the lead. On a scrambling play after a shot rung off the crossbar behind Stoever, Eamon Powell danced through a couple Phantoms in the left faceoff circle before finding Thomas Bordeleau just above Stoever's crease to tap in the goal at 10:10. 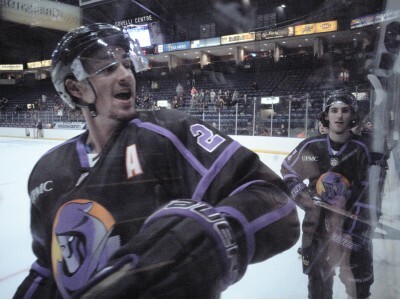 The Phantoms evened it up less than a minute later when Craig Needham carried the puck into the attack zone along the left boards, cutting in along the goal line untouched to put a backhand from just atop the crease that went five-hole on Grannan at 11:05. Hunter McKown regained the lead briefly for USA at 13:11 when he took a pass from Brett Berard in the slot for an easy one-timer that Stoever was not able to stretch far enough to get a piece of. The Phantoms took over from there. A pair of Brett Murray goals would give us the lead going into the intermission. First, when he threw a long range shot to the net that took a bounce off a USA defenseman and behing Grannan at 14:18. Then, Murray would muscle his way around a defender in the low slot and tuck a shot in stick side on the NTDP netminder at 16:44. The Phantoms continued to dominate in the third, starting with a Josh DeLuca goal at 6:44, taking a nice pass from Liam Robertson and ripping a blistering shot from the slot. Next Jack Malone floated a pass from the blueline to Connor MacEachern in the high slot. MacEachern danced through a couple of NTDP defenders and put a backhand in at 10:14. At 14:33 Liam Dennison sent a shot off the boards from well above the left faceoff circle that found it's way through traffic and in. Brett Murray would complete the hat-trick coming off the bench and intercepting a pass at center ice and skating around the NTDP defense to score with just 0:28 left in the game. Shots were 8-5, 9-11, 7-5 with the Phantoms outshooting the NTDP in the first and third frames and overall 24-21. USA was plagued by lazy passing, lazy puck clearing and a lack of hustle for most of the game. When they did put forth the effort, they were able to play us on an even level. It will be very interesting to see if they can adjust for the second game tonight. The Phantoms, for their part, played the kids well and avoided a lot of extra-curricular pushing and shoving. You won't win those battles against kids in face-cages and will just end up in the box. Neither team took any dumb penalties and the only penalty of the game was a hold by USA's Jacob Truscott late in the third that did not lead to a powerplay goal. A crowd of 1,210 was pretty decent all things considered. Tonight will be Military Appreciation Night, and there were 2,500 in presale tickets as of Wednesday with quite a bit more expected. We might get lucky and this weekend will get us out of last place in the league for attendance. If we play the same game as Friday, that'll be a lot of fans treated to some great hockey. Until then, here are a few of last nights highlights. Matthew Barnaby no look, behind the back to Trevor Kuntar for a goal! Jack Malone puts Connor MacEachern in alone for a goal! Hats off for Brett Murray!